KANNAPOLIS, N.C. (April 26, 2016) - The U.S. Military All-Stars are bringing "competitive, exciting, must-see patriotic entertainment enjoyed by millions" to Kannapolis on Saturday, June 3, for a special baseball game benefiting individual Wounded Warriors, State Department and Department of Defense and Recruiting. 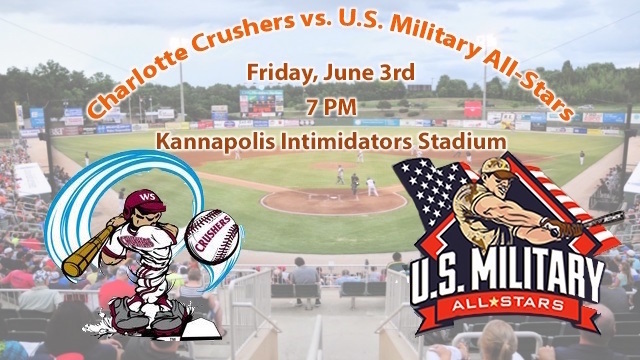 The "Red, White, and Blue Tour" is coming to Intimidators Stadium supported by Carolinas HealthCare System as the Charlotte Crushers take on the U.S. Military All-Stars for an All-American baseball game. Tickets can be purchased for only $7 at the F&M Bank Box Office on the day of the game. Gates open on June 3 at 6:00 p.m. with first pitch at 7:00 p.m. at Intimidators Stadium supported by Carolinas HealthCare System, home of the Kannapolis Intimidators. Leading up to the game, fans can enjoy a ceremony to honor United States veterans, the Armed Forces, and the nation. The ceremony, which will begin at 6:30 p.m., will open with a Walk of Honor to pay respect to all the men and women who have served in uniform. "Old Glory," the passing of the flag, will follow the salute to veterans leading up to the Star Spangled Banner. For more than 25 years, the U.S. Military All-Stars have been a modern-day barnstorming team promoting awareness for the honorable sacrifices of the American Armed Forces. The 28-man team is made up of active-duty servicemen who represent each branch of the United State Military. As part of the "Red, White and Blue Tour," fans will have the opportunity to take pictures and collect autographs from both the U.S. Military All-Stars and the Charlotte Crushers. For more information or to purchase tickets in advance, contact crushersbaseball16@gmail.com. The U.S. Military All-Stars promote the awareness of all American's in support of the honorable sacrifices our armed forces make at the "tip of the spear." They are the only team in history to wear camouflage uniforms with historical references representing all branches of the military and first responders. Pre game Ceremonies such as "Passing the Flag" and the "Walk of Honor" that celebrate American History in defense of our freedom make the game a special and memorable time. The Charlotte Crushers are a local wood bat summer baseball league consisting of players from all levels of college baseball. They provide competitive baseball in a fan friendly environment. The Crushers are a part of the Carolina Virginia Collegiate League, which are comprised of teams from North Carolina and Virginia. The Intimidators are preparing for the 22nd season of professional baseball in Kannapolis and 16th season as a Chicago White Sox affiliate. Since the team's inception in 1995, a total of 85 players have gone from Kannapolis to the Major Leagues. The team plays at Intimidators Stadium supported by Carolinas HealthCare System located off I-85, Exit 63 in Kannapolis. Single-game tickets are on sale for the 2016 season. Season tickets -- on sale for as low as $320 -- are available by calling the F&M Bank Box Office at (704) 932-3267 or by visiting IntimidatorsBaseball.com.